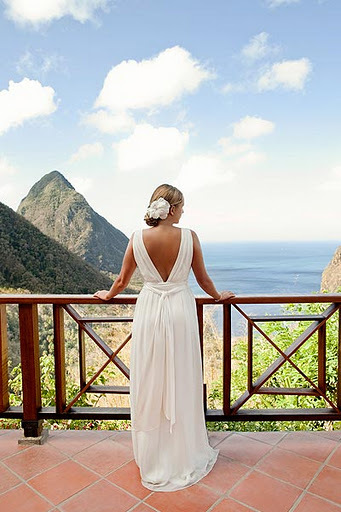 Ladera St Lucia offers open-air weddings! Stay at an open-air rainforest hideaway perched a thousand feet above the Caribbean Sea. Enjoy spectacular views of the volcanic Piton Mountains – a UNESCO world heritage site – from a private plunge pool in your own room. Ladera, a luxury resort on exotic St. Lucia, provides a unique experience for couples searching for a unique luxury resort retreat. All villas and rooms are constructed without a fourth, outward-facing wall, so flower-scented tropical breezes flow right into the room, and visitors can enjoy spectacular sunsets and views right from their bedside. There are only 9 villas and 23 suites in this ultimate rainforest open-air hideaway. Each offers fine linens, luxurious amenities and four-poster beds made of polished tropical hardwood. And each, deliberately without a fourth wall, invites the spectacular sunsets and astonishing views right inside, to be a part of your very private, very special retreat. Ladera prides itself on offering one of the most dramatic open-air destination wedding venues in the Caribbean. With spaces for ceremonies and receptions of up to 80 guests, the Pavilion is located along Ladera’s extraordinary rainforest ridge. Recently nominated as the Best Romantic Resort in the Caribbean by Caribbean Travel Magazine, Ladera. on the island of St. Lucia, is the ultimate Caribbean romantic retreat. Read about my recent visit to LADERA or to start planning your own Destination Wedding, contact the Wedding Travel Consultants at Caribbean Journey ~ 866-236-1924 or via email. WOW! Ladera is absolutely breath-taking. I would kill to be married at a place like this!